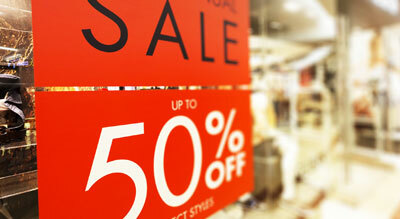 For a retailer, selling off outdated or unwanted stock requires effort and imagination. Nothing can be worse for a retailer than to purchase stock, display it for sale, and then find no one wants to buy. Not only has the purchase of this inventory cut into the cash flow, but it also takes up floor space that could be better used for merchandise customers actually want. Seeing the same merchandise day after day sends a subliminal message to regular customers that the store has nothing new to sell or that perhaps the store is having financial difficulties and can’t afford to restock with new goods. What can the owner do? Most impulse purchases are made near the checkout counter. To benefit from this moment, place slow-moving items near the checkout with signage advertising them as this week’s specials. Ensure sales staff can talk about the benefits of these products. For example, if the item is a silk scarf, the benefits may be current style, quality, elegant-feeling texture, newest colours, etc. Old inventory must be priced to move. Since you probably do not know the elasticity of demand for every class of product, you should initially set prices as close to break-even as possible with the hope of avoiding a loss. If you are having trouble selling a particular product, you might be able to move it by bundling it with a complementary or related product. Bundling enables the consumer to see how the products can be used together. A customer may not buy a router by itself but, if the router is bundled with bits, the package becomes more desirable. If sunglasses are hidden in the corner, moving them closer to the suntan lotion or the swimwear might create sales. Attractive window displays bring customers through the door. who are not at the moment interested in purchasing. will draw customers further into the store. Sales personnel with product knowledge create sales. structured to prevent erosion of the profit margin. percentage discount will often encourage the purchase. effort to get them out the door.